Lots of Americans say that sooner or later, they are going to "see Europe" and hop on over "the pond" to see "the old world" but to be honest, Europe can be a little daunting if you aren't an experienced traveler but the Mercury News recommends trying a European cruise to get a sampling of Europe without the hassle of trying to figure all the details out yourself. Taking a cruise offers the chance to cover a lot of territory in Europe without the hassle of finding hotels, restaurants and transportation. It's the sampler approach to visiting Europe. For fans of Royal Caribbean, seeing Europe is easy considering the cruise giant is increasing it's European fleet from eight to eleven ships next year, which will cover 27 countries and 78 ports. If that isn't enough of Europe for you, Royal Caribbean also offers pre- and post-cruise tours for extended visits. You can read a great report by the author's experience aboard Voyager of the Seas on her Mediterranean Cruise. But we were more enthralled with Port Grimaud. The port is nicknamed the Venice of France because homes and business are built on canals, complete with boats and bridges. Kitschy jewelry and apparel shops line the canals, most of the restaurants feature outdoor seating, and boat tours show off the seaside town created by architect Francois Spoerry in the 1960s. A sandy beach is also the ideal spot to rest after a long week. 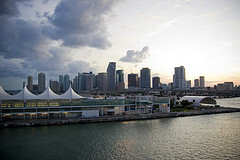 Port Everglades, in Fort Lauderdale, Florida, is gaining ground quickly on Miami, Florida for most cruise passengers in the world. Miami has been the traditional "cruise capital of the world" for many years but recent changes have made Port Everglades, located just 28 miles to the north, a close competitor. If current trends continue, Port Everglades will overtake Miami by 2012, thanks to in part, Royal Caribbean. Liberty of the Seas, currently serving Europe, will return to the United States next year and has been announced to call Port Everglades it's home port. Oasis of the Seas and Allure of the Seas, the two largest cruise ships in the world, already call Port Everglades home. This leaves just Majesty of the Seas left in Miami as Royal Caribbean's presence. Royal Caribbean Cruises Ltd.'s level of commitment is less clear. Richard Fain, chairman and CEO of Royal Caribbean Cruises Ltd., declined to comment on its future plans to sail from Miami, nor would he say whether Royal, which owns several brands including Celebrity Cruises and Azamara Cruises, intends to keep its headquarters at the port after its building leases expire in 2011 and 2014. Miami, for it's part, admits it needs to do more to lure Royal Caribbean back to Miami. Recently the port of Miami inked a deal with Carnival to keep Carnival in Miami until at least 2018 and County Manager George Burgess said, "We need to roll up our sleeves and negotiate with Royal, just like we did with Carnival". Port Everglades earned a lot of Royal Caribbean's new found loyalty thanks in part to how it handled the Oasis of the Seas situation. When Royal Caribbean was shopping for a home port, it received a lukewarm reception from Miami but Port Everglades agreed to double the terminal budget from $37.4 million to $75 million. Royal Caribbean then promised to send even more passengers to Port Everglades to compensate for the extra cost of the 5.5-acre super terminal, which has 90 ticket counters. Most ports of call welcome cruise ships and their many cruisers, who bring with them an influx of money to the local economy. However the town of Rockland, Maine has presented some new guidelines to limit the amount of cruise ships that may come to town in a given year. This move has infuriated local business owners who want more potential customers to come spend their money there. The Harbor Management Commission, which presented preliminary guidelines to the council, recommended limiting the number of cruise ships to three megaships, 15 medium ships and 35 small ships annually. The commission also recommended that the city tack on a $600 fee for any cruise ship that needs to restrict public traffic by the parks or public landing. This move impacts Royal Caribbean directly as the fee per passenger would go from $1 to $6 and Royal Caribbean has already requested that the decision be reconsidered or lowered because Royal Caribbean would have to take the loss as it's too late to pass the fee onto the passengers. About 33 cruise ships visit Rockland each year. Interesting story that will evoke different reactions, I'm sure. To me, it seems like a case of the town wanting to have it's cake and eat it too; it wants the tourists to come and spend their money but they want their town to be pristine and devoid of tourists. It's no secret that Royal Caribbean has been moving its ships from North America to Europe in large part to seek out the higher demand and bigger profits to be found in Europe. 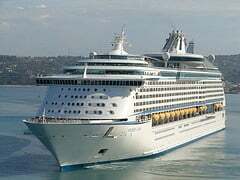 The Los Angeles Business Journal is reporting that the real reason Mariner of the Seas is sailing to Europe after a short stint in Los Angeles is not to find bigger profits but because of the recent surge of violence in Mexico. The widely publicized war between the country’s federal government and its powerful drug cartels has led to nearly 30,000 deaths since 2007. And on the West Coast – where 90 percent of cruises depart for the Mexican Riviera and other points south – the number of passengers in the last two years has dwindled by 21 percent. Royal Caribbean stands by its claim that the move to Europe is just for economic reasons and not because of the violence. 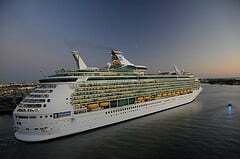 The Royal Caribbean cruise line, for its part, will say only that the decision is an economic one. Personally, I don't think the violence in Mexico helps the situation any, but given that so many other ships have left American ports for Europe, it isn't hard to believe that Mariner of the Seas is (pardon the pun) in the same boat. Royal Caribbean isn't trying to hide the fact that they are chasing larger profits based on the numerous statements from Royal Caribbean in the form of statements to the press as well as blog posts. Royal Caribbean looking to expand to Nicaragua? The Spanish language site Estrategia Negocios is reporting that Royal Caribbean is working with the country of Nicaragua to rebuild the port of San Juan del Sur. 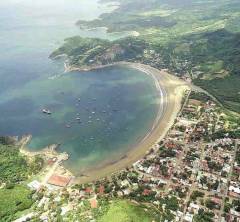 The idea is to rebuild the port, which will promote more cruise ships operating in the Pacific to stop in Nicaragua. Nicaragua Tourism Minister Mario Salinas sees the cruise business as "a segment to exploit. " In addition, the Nicaraguan government is also working on the construction of 'inter-oceanic canal in Nicaragua tourism', a mechanical transport system move boats and yachts between the Pacific and Atlantic oceans. Perhaps Nicaragua is looking for something similar to the deal that Royal Caribbean has reached with Jamaica to open a $170 million port at Historic Falmouth Jamaica. By opening a new sea port, Nicaragua seeks to increase the weight of the tourism industry in the country, to which the sector currently contributes about 5.2% of GDP, with about 930,000 visitors during 2009, which resulted in an increase of 8.6 % from a year earlier. Nicaragua ranks low in tourism compared to its neighboring countries such as Costa Rica and so this, along with other measures taken, will hopefully increase tourism in this Central American country. Read more about Royal Caribbean looking to expand to Nicaragua? While recent news has Norfolk, Virginia losing it's Royal Caribbean ships, Balitmore, Maryland is experiencing an influx of growth that has made the port of Baltimore a new hub of cruise ship activity with the arrival of the second year-round cruise ship to call there. Carnival, Celebrity and Norwegian lines all have ships in Baltimore and now Enchantment of the Seas will call Balitmore home. Baltimore's cruise terminal was built in 2006 and in 2008, 27 cruises left from Baltimore. In 2009 and 2010, cruise business grew three times that and a record 113 cruises are already scheduled for 2011, with an expected 240,000 passengers, compared to only 47,000 three years ago. Port of Balitmore representative Richard Scher says the Port of Baltimore is such a hot spot because of its location. It's right off I-95, just 10 miles away from BWI and within 90 miles of three other major airports. This past Saturday marked the last cruise out of Norfolk, Virginia for Royal Caribbean. The company has decided to move Enchantment of the Seas north Baltimore, and the reason for the change seems to be about demand. Company spokesman Harrison Liu mentioned that Baltimore offers "a year-round demand for passengers". Royal Caribbean had been serving Norfolk since 2007 and Enchantment of the Seas was the final ship to call Norfolk home. Oasis of the Seas to cease Nassau stops? There's a report out that Oasis of the Seas, pride of the Royal Caribbean fleet, is planning on ending port stops in Nassau, Bahamas. On the other side, Vincent Vanderpool-Wallace, minister of tourism in the Bahamas, denied these claims that were first reported by Tribune Business and other media. The news is particularly alarming to Bahemians who recently voted to spend $44 million of taxpayer monies on the Nassau harbour dredging. There hasn't been any comment by Royal Caribbean officially on the matter. Crime in Nassau has been in the news and could be a reason why Oasis could be changing her itinerary, if it is in fact true. Read more about Oasis of the Seas to cease Nassau stops? We all tend to think of states like Florida or Texas when it comes to the state we leave from for a cruise, but for those in the mid-Atlantic states, there's still lots of activity out of Norfolk, Virginia aboard Royal Caribbean's Enchantment of the Seas. Enchantment of the Seas serves Bermuda as well as other Caribbean ports of call and WAVY-TV 10 is reporting many who frequent Norfolk as their departure port are loving it. "Cruising from Norfolk is a hit with local passengers like Tom Anthony who finds it a bargain too. He is just returning. "We live in Chesapeake so to be able to be dropped off here and get on a cruise ship and not having to travel a whole additional day to and from makes it a lot better value for us. But also the price is about what you would spend on a hotel and they throw in all the food you can eat for free and drop you off at a beautiful place like Bermuda," Anthony said." With so many ships heading to Europe to chase the high demand there, it's good to hear smaller ports like Norfolk are still generating demand to keep ships serving that port and making it easier to get to your next Royal Caribbean cruise. If you've been on a cruise before, more than likely, you've been to Nassau, Bahamas. Nassau has become the ubiquitous stop for most cruisers due to it's proximity to the United States eastern shore cruising ports. Many seem to have a love it or hate it opinion of the port but there's definitely good reason many ships make a stop here. Beaches: Nassau has an assortment of private and public beaches to choose from that are sure to please most beach goers. While Nassau beaches aren't the absolute prettiest in the world, they do embody that typical Caribbean white sand and blue water motif that many seek on any vacation into the Caribbean. Shopping: The downtown area near the dock area is easy to navigate and offers a variety of shopping options. Nassau isn't known for having the best deal on much, but pricing here can be a bargain when compared to buying the items back in the United States. Liquor tends to be a good deal, especially the local variety. Historic landmarks: While not renown for its historical significance, there are some rather interesting historical landmarks to see at least once. These relics from the British colonial era can be fascinating and educational to see. "Pushy" locals: Nearly all ports in the Caribbean will have their share of locals trying to persuade tourists to get their hair braided or take a taxi cab or some other service. While the pushiness in Nassau isn't as bad as other islands, it's still existent and can be an issue for those who do not like being approached. Lack of exoticness: Even proponents of Nassau will admit that Nassau and Paradise Island aren't the most exotic of locations. Other ports in the Caribbean tend to be much more exotic looking and intriguing a destination. If you choose not to get off the ship at Nassau, be sure to look into deals on board the ship for deals as port days often bring better deals at the spa, among other locations.